And how can I remove the film? I have soaked it in soapy water, scraped it with a plastic scraper, and run it in the dishwasher several times, but I can't seem to get rid of the film. As others have already said, it appears to be polymerized oil. It happens when oil is left in the pan hot for a long period (temperature depends on oil), or smoking for not as long. However, lye probably isn't required to remove it. Bar Keeper's Friend and a bit of scrubbing will probably manage to take this off. As an advantage, while getting BKF on your hands will dry your hands out, it won't cause injury—unlike lye. Alternatively, a scouring pad and plenty of elbow grease will take it off as well (though will also leave shallow scratches in the stainless—it'll not be polished anymore). Or, similarly, a sanding block or sandpaper. I wouldn't put an aluminum core stainless (or tri-ply) in an oven on the self-clean cycle. Those get very hot, somewhere around 900°F, and I'd not at all be surprised if the pan warped. This looks like half-polymerized oil. It happens when you overheat a layer of oil in the pan. It won't come off through scraping. If you insist on removing it mechanically, you will have to try a polishing brush on a Dremel or something similar. I remove these chemically. Make a lye concentrate in the pot and let it sit overnight. Rinse very (!) thoroughly. This works well on stainless steel - but don't ever use it on aluminium pots! If you don't have lye, you can also try a weaker alcali solution, like baking soda. But I doubt that it will be enough to remove the stuff. To avoid it from happening again, don't overheat. This happens if the pan is left empty at at least 200°C for a very long time (or higher temperatures for a shorter time). There is no cooking method which requires this. Most things done in a pan are OK at around 150 to 160°C - if you are making steaks, sauteeing, etc., you should start using lower temperatures. Wokking needs these high temperatures - but first, a shallow SS pan is not good for wokking, and second, you should have more oil in there while preheating, and then move vegetables continiously around the pan while wokking. So this layer shouldn't happen at all. 1- Pour can of diced tomatoes into pan. Cook over medium heat until tomatoes start to bubble, stirring occasionally. Stir heavily once bubbling, then discard tomatoes and wash pan. 2- Fill pot with a large amount of rhubarb and water. Boil for a long time, adding water as necessary. Discard and wash.
OP also asked why this is happening. It's not absolute temperature; it's temperature relative to the smoke point if the oils you're cooking with. Let me guess -- extra virgin olive oil? Try using higher smoke-point oils when you're saunteeing and doing high-temp things generally (peanut, sunflower, safflower, coconut, etc). If the rest of the handle is also stainless steel you can put in your oven during a 'self-cleaning' cycle. The high heat should reduce that film to a charred residue to be cleaned off. You might also try just pouring a can of Coca-Cola (not another cola drink) in the pan and let that sit over-night. The acid in Coke is strong enough to dissolve a nail, it will probably make short work of this. I have a D5 Brushed Stainless pan and I got a stain like this when I let my olive oil get too hot and it started smoking a bit. I tried soaking and it just didn't budge. I decided to try baking soda. Put about an inch of water in the pan and then add in baking soda, making a paste. Let this sit on the stain for 5-10 minutes. Then scrub. I use a cotton dish rag for scrubbing but a folded paper towel seems to do in a pinch. If that isn't strong enough add in some salt and scrub some more. It took about 30-45 minutes to clean the section of my pan that was stained. 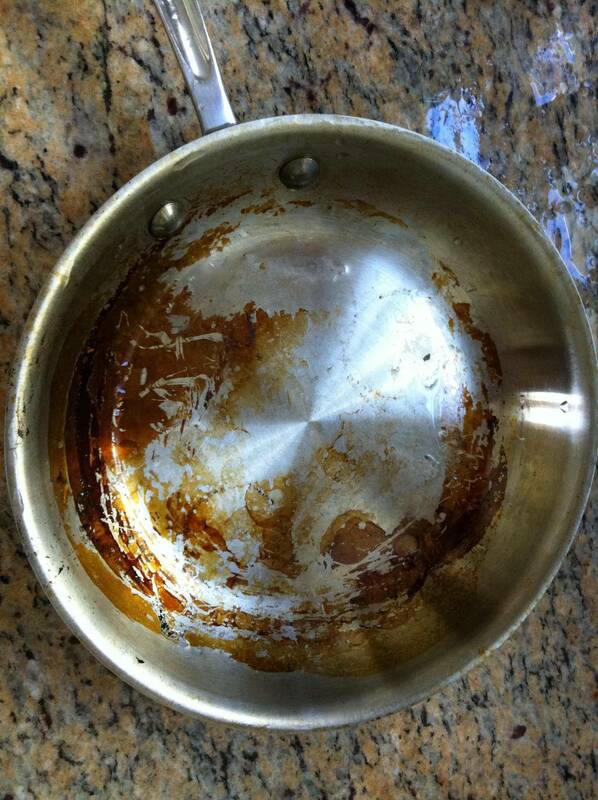 This pan will probably take over an hour of scrubbing to get clean. just keep working on it and you can get most of it off. I have had this happen to me also. I have found that using Cameo has helped me. I agree, Bar Keeper's Friend by far is the best. You will never need steel wool again. Also great for SS sinks. Then a quick wash to release the pwdr residue. Before I found BKF, this optional method is only for Stainless Steel Sinks, I would the fill pot half way with water and ½ cup of DishWasher powder, Cascade if possible or use more with liquid. Bring to a boil and ventilate the kitchen. It will help release and burned food and oil enough so you can scrub it off. Also using a metal spatula helped to, but it will leave some scratches. But I was able to use the pot again. You need to weigh the options. You can also warm the pan under very hot water, then scrub with a paste made from the DW powder. Use gloves. I've had success with SOS pads (Steel wool with embedded detergent). It's not easy, and it takes a while, but I can get my steel looking like new. You'll need to re-season it before use. Forget the rubbing and scrubbing with Bar Keepers Friend or Cameo. This way is quick and easy. Heat the empty pan on medium heat for about 2-3 minutes. Take pan outside and spray with Easy Off oven cleaner (yellow cap not blue). When you spray the pan if the oven cleaner evaporates allow the pan to cool a few seconds and then continue spraying. What you want is the oven cleaner to foam up and stay on the pan. Allow the cleaner to stay on pan for 4-5 minutes and then rinse off with hot soapy water. Your pan will look like new. Do not use this method on aluminum pans. ProTip: Try a Fabric Softener Sheet (really!). The ones you throw in your dryer. Fill pot / container with Hot water and add a sheet. Allow to soak overnight. Use plastic scrub brush and don't remove sheet as you're scrubbing - scrub with it (slightly abrasive). Not the answer you're looking for? Browse other questions tagged pan stainless-steel or ask your own question.